I am going there myself. I have been going for the last 4-5 years as a representative of the Illinois Mycological Association. I will be at the craft and souvenir areas. The move to the fairgrounds at Henry is for the first time, which was done to expand the event. Previously it was in Magnolia where the best food venues were fundraisers for local churches and volunteer fire department. 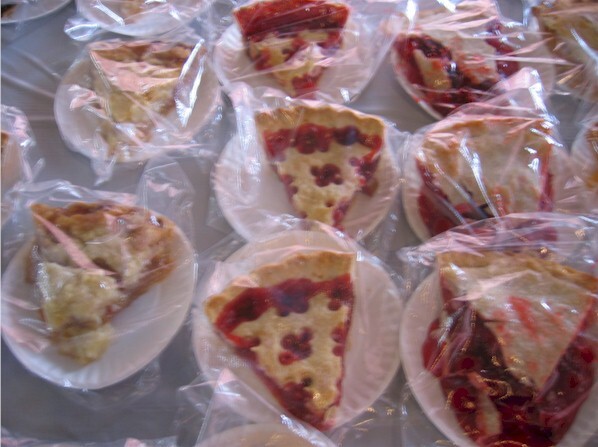 An Elks-type club did breakfast; the local church did a 'BBQ' sandwich (more like a sloppy joe) and (almost all) homemade pies sold whole or by the slice; and fire department did a butterfly pork sandwich. There were some commercial vendors offering (fresh from the freezer) pork tenderloin sandwich, a family making tacos, fried onion loaves and other carnival type food like elephant ears. What food will be like this year is anybody's guess, though I always lean in favor of the very local fundraisers. 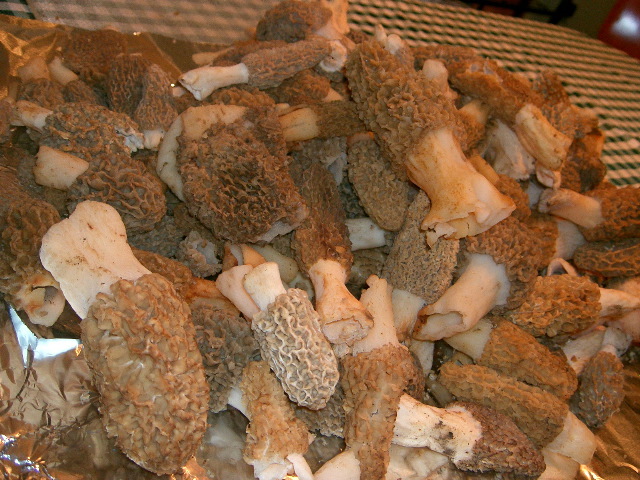 Are you going to be one of the morel hunters? Yes, I will be a hunter. 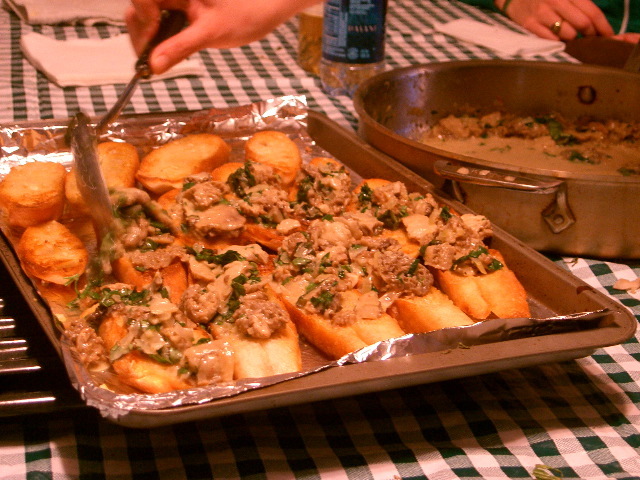 It's good to hear the morel-fest is worth returning to-- this will be my first time. I am very excited. 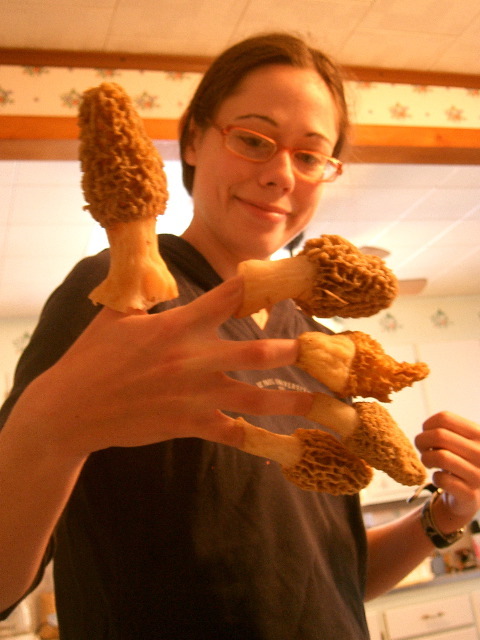 I am hoping to find 10 morels in the hunt: that's my goal. My other goal is to have a weekend of eating delicious things. And I am encouraged by your descriptions of previous years-- pies!-- and also by this pic you took from last year, which I just found. I will try to say hello-- can't imagine the Illinois Mycological Association folks will be hard to pick out. Do you (or anyone) know of any place worth stopping on the way? You know, just in case? Note: Henry is far from being considered central Illinois, though western may be more applicable. To me it is pretty amusing all the people dressed in camouflage to chase a morel. Do they believe the morel will run and hide once they see them? Poor morel is anchored to the Earth until someone comes to claim it. This year I had her peach pie, which was as good as this lady has made so far. 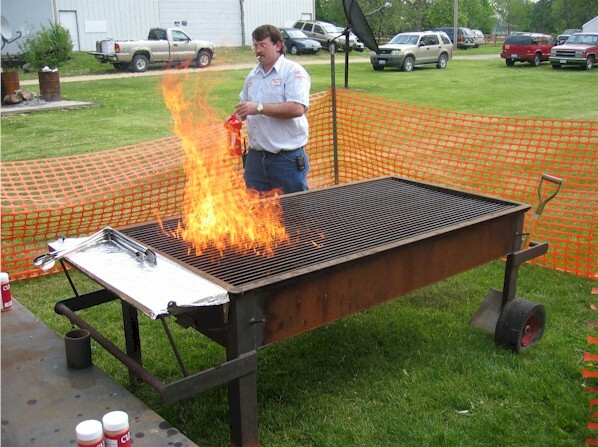 The grilled butterfly sandwich was available from the American Legion, whereas in Magnolia it was the fire department. Of course I do recall fondly my conversation with the firefighter spraying a live fire with charcoal starter. I inquired if that was really advisable to do. Another firefighter cracked, "We know how to put them out and we know how to start them." Wyanet is west of Princeton. 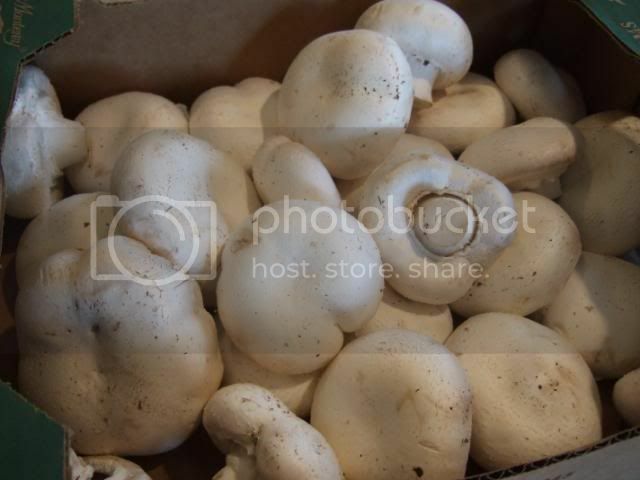 Princeton has a commercial mushroom grower. Twice a year they sell their mushroom compost for $10 a pick-up truck load. At the gatehouse you can arrange buy really fresh mushrooms. 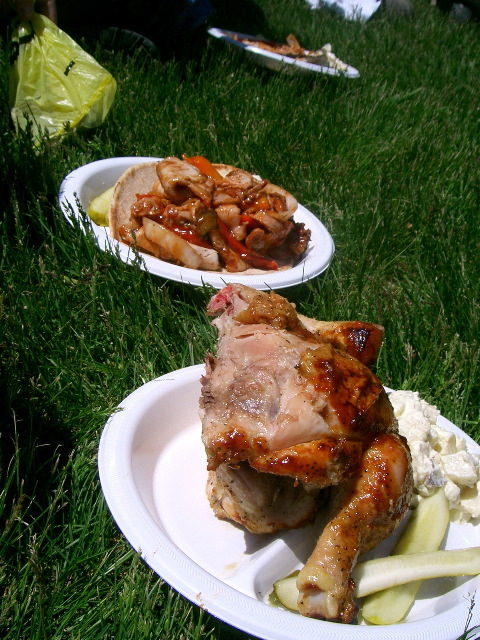 Back to the morel fest ... the other two food offerings were pretty mediocre. 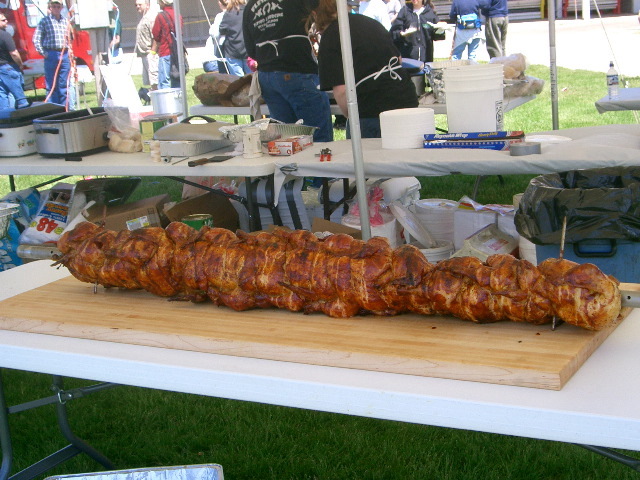 One vendor sold pig, cow or 1/2 chicken on a pita, your pick for $7. The other vendor made a big deal out of a breadless pork tenderloin. When I inquired what did that mean, he explained it was an oversized ground pork steak. Let's see it wasn't a tenderloin, it wasn't steak, it was really a ground pork patty. I stuck to the local fundraisers and collected tips of places to eat beyond the fairgrounds. Please note Willie's is closed on Sundays. These tips were cut from two slabs: one was dried out and the other was juicy, smoky perfection. Meanwhile a group of local teenagers walked over to eat their fill. They took seat at the booth al fresco, then heaped lots of love and affection for Willie's pork cookery. Meanwhile Willie came over to check on my verdict. 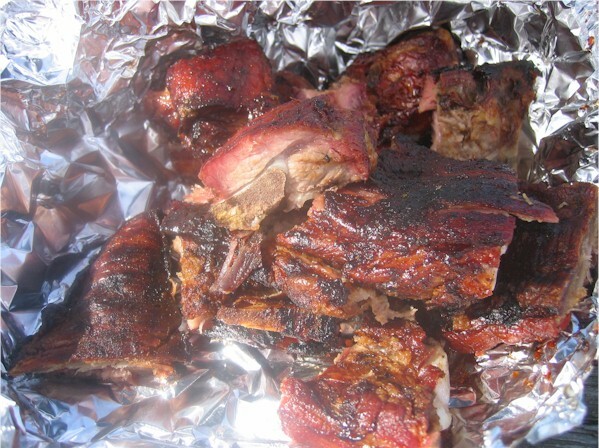 It was easy to praise the perfect rib tips, while ignoring the ones past their prime. I inquired if this was a good weather business. He indicated he had just taken on the gas station, which he was painting and planning to fix up for eating inside. I told him I belong to the Southern Foodways Alliance, whose annual conference includes a catfish dinner in a converted gas station. When he learned it was in Mississippi, then he advised he was from the delta. This rang a bell in my mind, so I asked him about his tamales. He advised the tamales are hand made by himself as he learned them in the Mississippi Delta. He emphatically stated he uses no masa, only cornmeal and the filling is beef. I told him I was very interested in trying these tamales and lamented even more my missing them. When I advised Willie I planned to come down in a month or so for a promised fried turtle dinner. I think at that moment Willie became my new best friend. He claimed to have talked to someone about fried turtle just an hour earlier, but didn't know any was nearby. We made a deal, the next time I come down he will hold tamales for me. In turn, he will come to the fried turtle dinner wherever it is held. A high five sealed the deal. Willie advised he has another restaurant in Peoria serving BBQ and tamales, which he runs with his wife. I have to admit my visit with Willie was the high point of my day. A source for real Mississippi Delta Tamales is something not to take lightly. Southern Foodways Alliance is collecting oral histories, our Rene G made a contribution on the Chicago Connection. Cathy2 wrote: They took seat at the booth al fresco, then heaped lots of love and affection for Willie's pork cookery. Great report, as is your Ripp's Tavern post. I particularly like the BBQ gas station pic. Couple of drum smokers and a makeshift eating area. Quite evocative to a BBQ guy like myself. Cathy2, I came by the intersection of 29 and 17 on Sunday, Willie's is closed. I go to Peoria frequently to visit MIL but we typically drive down on a Sunday, I guess we'll have to make a Saturday trip some time. We did make a Saturday trip once last summer but as much as the smoke at that corner smelled wonderful, we were on the way to take MIL out to lunch, Chili's I believe, she likes it. Sigh. Gary - I had the feeling you would really love this setting, if not the food. Long ago, pre my interaction on these boards, I bumped into makeshift BBQ in gas stations down state. This was my first in a very long time. There is a lot to Willie to like from the whole ambiance to the BBQ and tamales. I'm sorry I don't have a photo of the man himself, who looks like a blues musician with the dark glasses and hat. Likestoeatout: You can always bring a cooler to try some without ruining your appetite, then have the balance later. At least it is worth a stop to visit. C2, I usually carry a hot/cold bag in my car because frequently on return trips from Peoria we will stop at Ron's Cajun Connection in Utica. Even if we eat in we usually bring home some boudin or carry out goodies for later. Good lord am I jealous you found Willie's Tamales & Smokehouse. (I mean, of course, I'm happy for you that you did-- like when a co-worker who you genuinely like gets that promotion.) 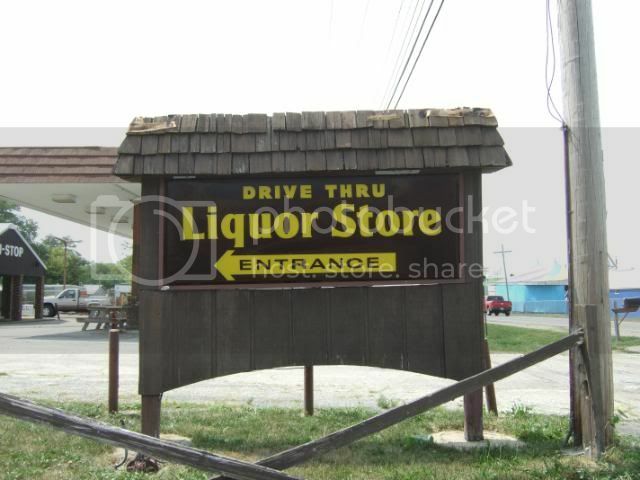 That is just the kind of place I dream about stumbling upon. But I guess that's what this board is for-- organizing the collectivized stumbles of thousands of motivated eaters. I had a solid breakfast at Nan's Place (ham & eggs & fried potato)-- a cheerful place that helps ease in a Morning After a Big Night. We had a slice of rhubarb cream pie from the church ladies (and gentlemen), which I thought was pretty delicious, though strange. However, in the realm of pie, there was one Supreme Ruler, and her name was Jane Grzetich. Jane had a booth inside the barn selling pies and pepper jellies. I can say without hesitation that her Dutch apple pie was the best apple pie I have ever eaten. I was not the only one of that opinion, either. I mean, using the info on her jelly label, somewhat creepily, I googled her address and sent her a thank-you letter when I got back to Chicago. I really felt strongly about it. Perhaps I am digressing-- back to central IL food options: I've actually been to Ron's Cajun Connection, and had a good experience-- more than serviceable oyster Po' Boy, and notably delicious homemade bourbon pecan pie, which Ron gave us a free taste of-- so sure that its deliciousness would inspire us to order more slices. (He was correct.) Also I liked the fact that Ron's is basically at the junction of two semi-desolate, rural highways, nothing around for miles, and when we were there, the place was almost full. This was, for me at the time, an excellent stumble. ** her blog-handle is The Chicken, and her recipe-writing and food-essays have won her, among other things, a 3-week honeymoon to Southern France. I will say: she is a good friend to have. 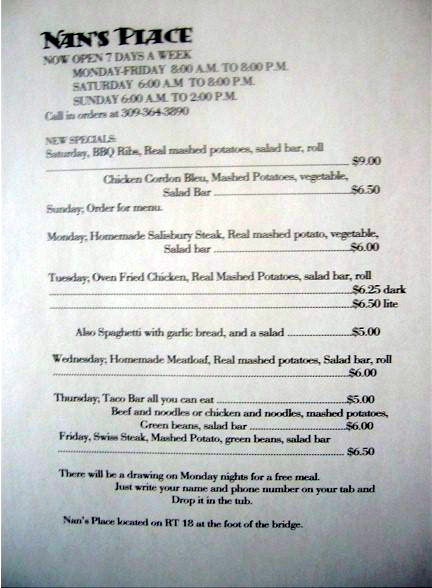 Mona's and Capponi's used to competing establishments (albeit with much the same menu). I grew up quite a ways from there, and so we went only once in a blue moon. I remember really liking the tortoni and neopolitan ice cream for dessert. Very exotic! A number of years back, one of the restaurants bought out the other, and now they're run by the same family. I have to say that the owners are lovely people, and are very generous and friendly. They have the odd central-Illinois habit of calling tortellini "ravioli" on the menu. Along with pasta, they serve steaks and they're pretty well known for their chicken. Although not at their 2 new outposts, Bernardi's in both Pontiac and Morton (I think). Anyway, I went to a party at the Bernardi's in Pontiac a couple of weeks ago. The fare was limited to fried chicken, green beans, salad, and tortellini, so that isn't a wide sampling of the menu. And relishes on each table beforehand. The relishes were radishes, carrots, etc. The salad was simply iceberg lettuce with 1 whole radish. The chicken was deep fried and heavily heavily breaded. I felt it was a tad greasy and the coating too thick. The green beans didn't have much flavor. The tortellini was awful. It was in some kind of pinkish sauce that adhered to the pasta. Sauce is maybe the wrong word. Coating is more like it. It was a pinkish meat coating. It had the strangest taste. Didn't taste like any tomato sauce, or vodka sauce, or anything pink I'd ever tasted. I couldn't begin to imagine what ingredients were put together to produce something that tasted like that. I finally settled on Campbell's tomato soup, but without the flavor. Having said that, many of the party-goers went back for seconds! And the place is so crowded, you'd think they were giving the food away for free. And one family I know goes to Mona's every week. So people in central-Illinois do like the food and enjoy going there. I may not post much about undiscovered gems -- but if I can keep just one person from going to these places, I'd consider it a favor to food lovers everywhere. At least these places serve drinks. Thanks for the heads up. Sometimes when you are out in the middle of nowhere you still have to flip a coin and go. Still it is nice to have advance feedback. Is there any place to eat in Toluca you do recommend? I don't mind being told to go to the next town, if that is what you suggest. If you do have those hidden gems, especially in these remote areas, I hope you will report. You never know when someone else will follow your footsteps and be grateful to have the better meal because of your post. Just from this recent trip, I learned from Dabney's and you about the tortellini's referred to as ravioli. At least for me, that is a golden nugget of very regional information. It is up there with the lady who confided in me about the fried chicken competition between bars and restaurants in LaSalle county. We were recently in Peoria again to spend some time with the MIL. On the way home we decided to wander some instead and wound up spending the night in Kewanee. We proably could have come home but we had spent the morning at Dickson Mounds near Havana, stopped at a few nature areas and spent time with mom, we were exhausted. I asked the 80 yr. +/- clerk if there was some place to have dinner that wasn't a Pizza Hut or the like, for a town of 14,000 Kewanee is well represented by the chains including Wal-Mart. She directed us to the Barn House restaurant on Rte.78/34, just south of the downtown. The place is a little on the dated side in appearance but we were warmly greated by the host and our waitress and seated in a booth near the door. It was pretty obvious that the place was well patronized by locals who were on first name basis with the staff and even knew what each was going to order. My SO is a vegetarian but can pretty much find something to eat anywhere however in a town that bills itself as "Hog Capital of the World", I was worried. SO had fettucine alfredo served in one of those skillets a skilltet omlette comes in, HUGE. I ordered pork tenderloin off the "specials" menu and got two breaded pork tenderloin patties easily over 6 inches in diameter each, served with mashed potatoes and covered in a peppery brown gravy. We each decided to have a glass of wine which was served filled to the top in a water goblet! The meal opened with a basket of bread and salads that had a nice blend of lettuces and a killer garlic dressing. Our waitress was fun, helpful and efficient but the best part of the whole meal, the bill for the two of us came to $17, including the wine which was $2 each! It was a wonderful, filling meal, we each brought home enough for another meal. This place is open for breakfast through dinner and has a wide variety of things on the menu, all very reasonably priced. 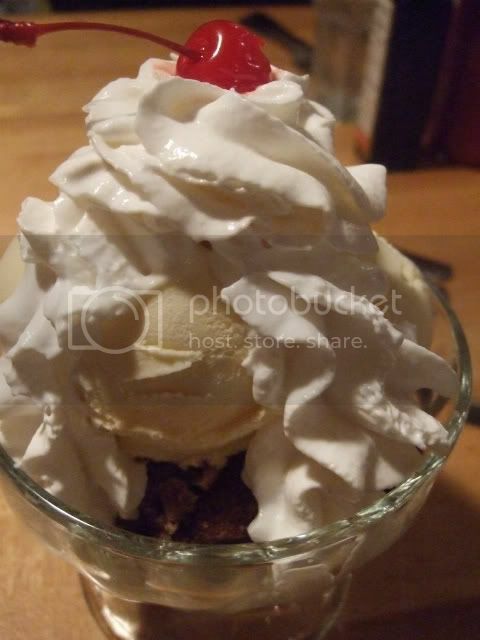 LikestoEatOut, I had very different experiences the two times I ate at The Barn. Both times, I found the food to be canned, tasteless and unappetizing. The potatoes were instant, the gravy was from a jar, salad consisted of iceberg and bottled dressing, and Wonder was the only bread in the place. The meat was overcooked and dry. There was no cream for coffee, not even whole milk, only skim and nondairy creamer, powdered, as I recall. And the glasses and silverware were dirty. You must have hit them on a very good day, or I hit them on two very bad ones. Glad your trip was better than mine. The Barn House is what it is, a small rural town restaurant. It's not Chicago class cuisine and remember, the two of us ate a very large, filling meal with wine for $17, what do you expect? The salad we were served was not iceberg lettuce but mixed spring greens with raddicchio and a very nice and very garlicy creamy dressing. The bread was a basket of rye, raisin and wheat mix with a few bread sticks, not wonder bread. I had two large, moist on the inside, crispy outside pork tenderloins, the mashed potatoes were bland but the tenderloins great. The wait staff was more than pleasant and seemed truly interested in giving good service. The place was packed with people who seemed like they ate there alot and knew everybody. As I said, it is a small town and a much better option than any of the national chains nearby. 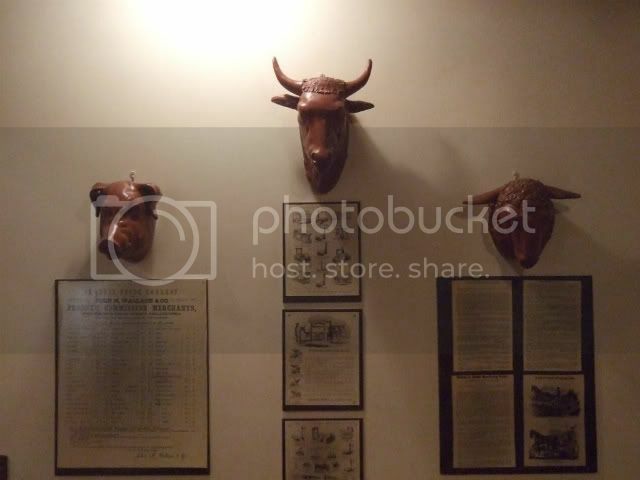 We didn't expect much especially since my SO is vegetarian but it was better than some of the other small town places we have tried in the past, sorry your experience was not as good. Last edited by LikestoEatout on August 11th, 2006, 7:33 am, edited 1 time in total. While we know LikestoEatOut ate there recently. How long ago was your experience? From reading both accounts, it is a night and day experience with maybe a new cook or ownership involved? I first ate there a year ago; next ate there in January. After two bad experiences, I decided not to go back, so I hope you're right that maybe mgt has changed: I'm in that area often and would love a good place to eat. Again, glad your experience was a good one. When was this, btw? I can just hardly believe it, frankly...Only a change in mgt and/or cook could explain such a difference. I was at the Barn House in May, like I said, it is what it is, nothing special but decent. 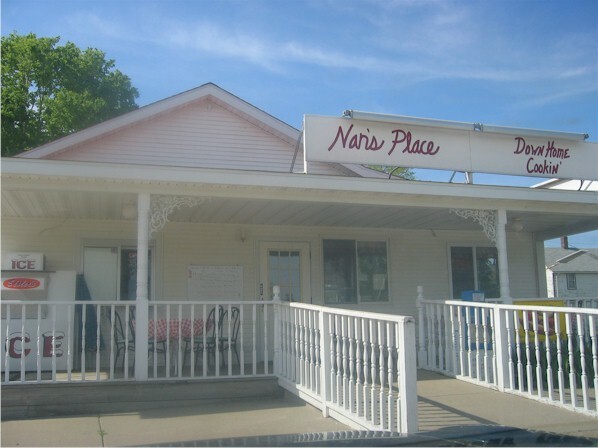 I have been traveling to the in laws in Peoria for 28 years now, we have tried many little places along the way in Princeton, Henry and Chillicothe, most have been dismal and in one case, dirty. We have had a few good hits in Oglesby, Buster's truck stop in Mendota and some in Ottawa and LaSalle, otherwise we just drive on to Peoria and eat at the in laws. BTW, Cathy2, we passed Willie's in Sparland but it was at 10 am when he was setting up and at his closing time coming home, I'll get there yet. Last edited by LikestoEatout on August 14th, 2006, 3:44 am, edited 1 time in total. Hey, I love to find "decent"; I don't necessarily need something "special." I will be out near Bishop Hill for an event later this month. I hope we might find time to check it out. 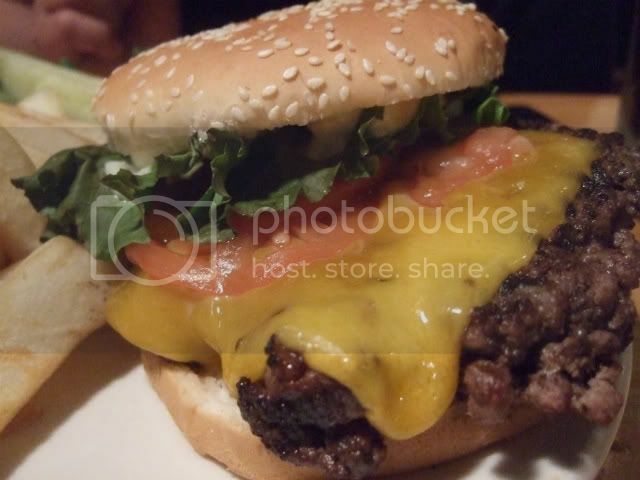 Likestoeatout -- I look forward to the day you finally do eat at Willie's. I was just thinking yesterday I need to renew my contact with the people down there who know where to get fried turtle. I remember you mentioning that you hadn't been to the Cajun Connection in Utica when I first started posting...if you have time and still haven't sampled the boudin, I highly recommend the small side trip off of I-80 on your way to Bishop Hill to try it out! (Or, bring a cooler bag and take some frozen home). The pottery shop and the quilt shop are worth a visit, too. Have fun. Ron's Cajun Connection in Utica is one of my favorite places! Everything is good there and we usually bring home extra. He sells boudin in frozen packages and also sells his Hot Damm rub which goes good in chilli and many other things. Ron's is a perfect halfway stop for us on the way from visiting MIL in Peoria. LOVE, LOVE LOVE Ron's Cajun Connection. Never had a bad meal there. I'm always sad because I forget to order a whole pecan pie to bring home. The place is always packed when it's open. 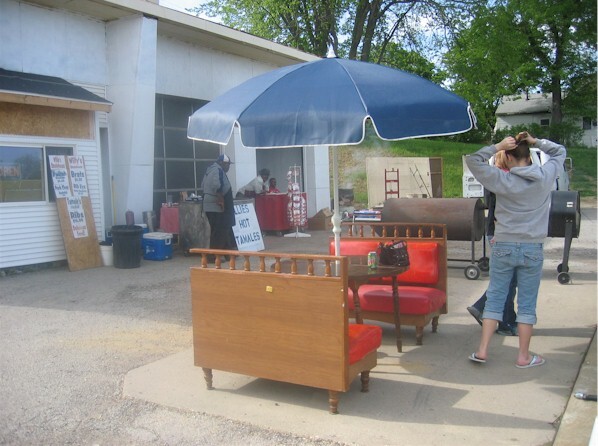 Carol wrote: Hey, I love to find "decent"; I don't necessarily need something "special." Carol VERY good rec. Very much enjoyed my catfish there last night. And the prices were especially not bad! Besides the catfish, there was great bread pudding with ice cream for dessert. So glad you liked it! I've eaten there four or five times and have never been disappointed. there used to be a restaurant around chillicothe that was famous for breaded pork tenderloin sandwiches. i think it was something like BBs Diner [although i'm unsure about the spelling]. as of about 12 years ago, i know it was still operating. 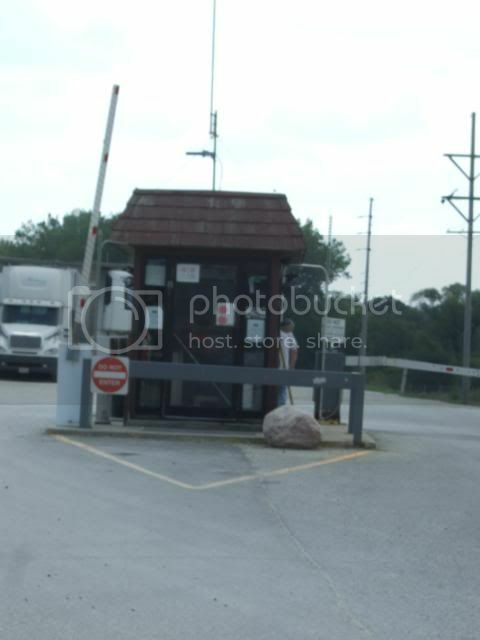 does anybody know where it is ... or if it's still around. my dad was a salesman with his territory for lumber sales in illinois, iowa and kentucky. 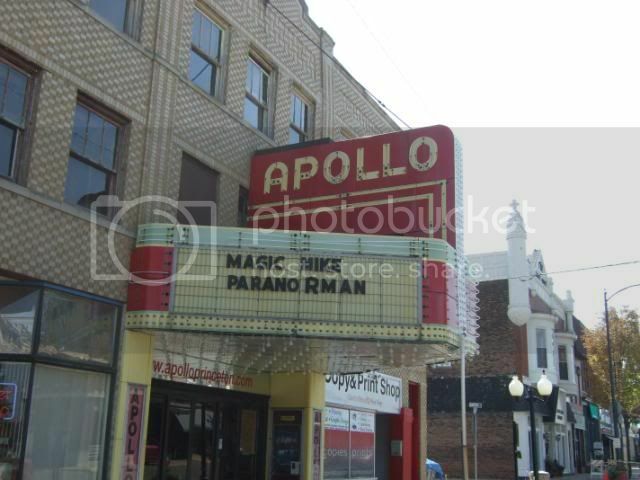 he used to rave about this place and took me there once in the late 1960s. years later i used to do business w/ a guy from chillicothe who also used to talk about the place. ring any bells with anyone? i'd appreciate any information about that specific restaurant ... or wherever else one may procure the PERFECT breaded pork tenderloin sandwich in this area! 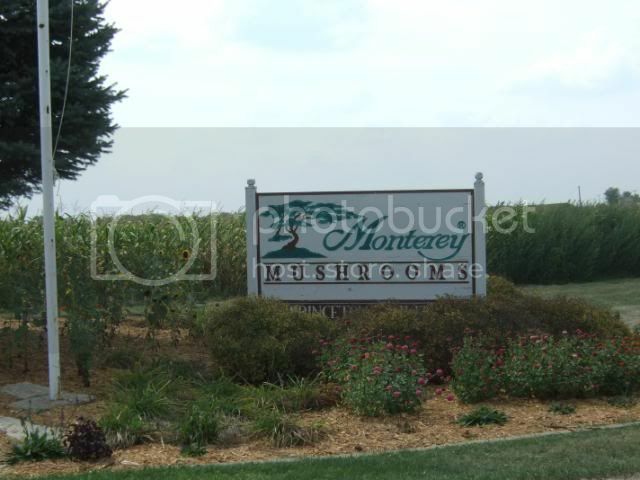 A quick 35 mile shot off of I-80 on I-74 on our way back from a day of eating in the Quad Cities we hit Galesburg, IL. to see whats what. Decided upon Packinghouse Dining Co. for supper. 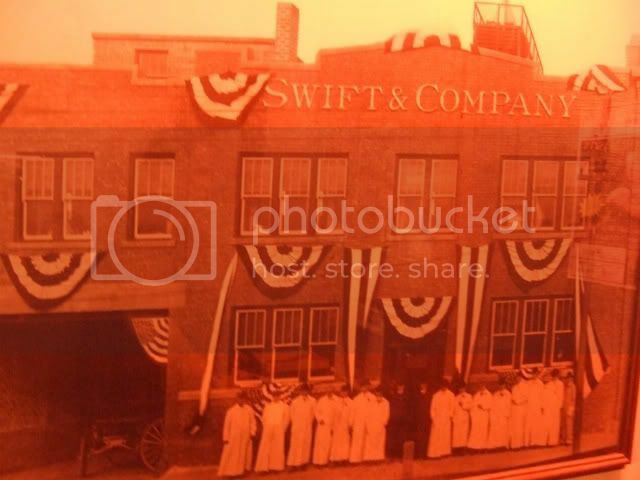 An old Swift meat packing plant turned into a restaurant, just my style. Midwestern grub at its finest, burgers, steaks, big salad bar, etc. 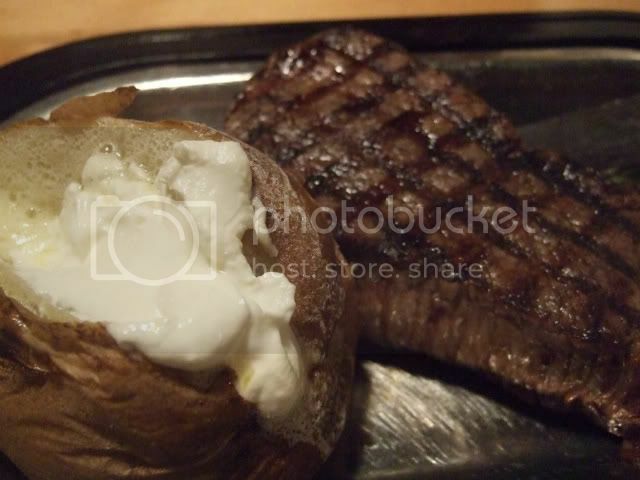 We went with a burger, & the sirloin steak. Both well prepared with fresh quality beef. They have these cinnamon rolls there that are pretty damn good, I got two allotted to me with the salad bar I added to my meal, I can see why the ration these, layers of pastry dough, tons of sweet cinnamon sugar, and a crunchy cinnamon crust. So good I had to have a Cinnamon roll sundae, and take a 1/2 dozen home. heading back here for sure. 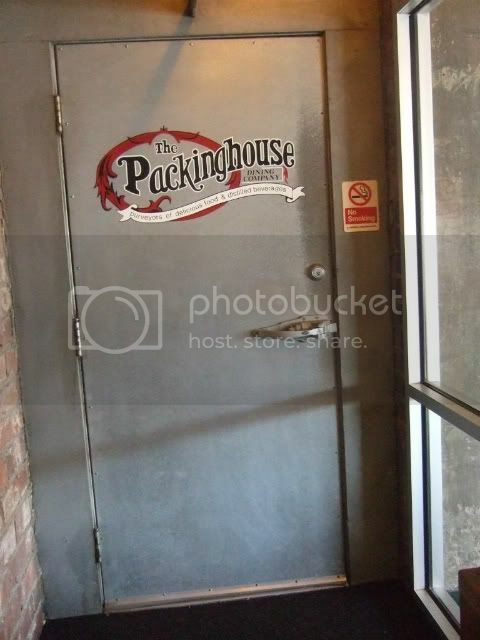 Packinghouse Dining Co. is now closed, a new restaurant in its place. Out in the Princeton area a bit, Either a quick shot down I-80 or a scenic cruise down US 6/34. Monterey Mushrooms is the real deal, the guard at the gate sells the shrooms(cash only) from a reach in cooler in the guardhouse. Choice was white mushrooms or portobella. $3 for 5 lbs of monster whites or $5 for a 5# of monster portos. Some of the freshest mushrooms I have ever eaten(I some stuffed with Wyanet Meat locker brats & did some sauteed with butter). 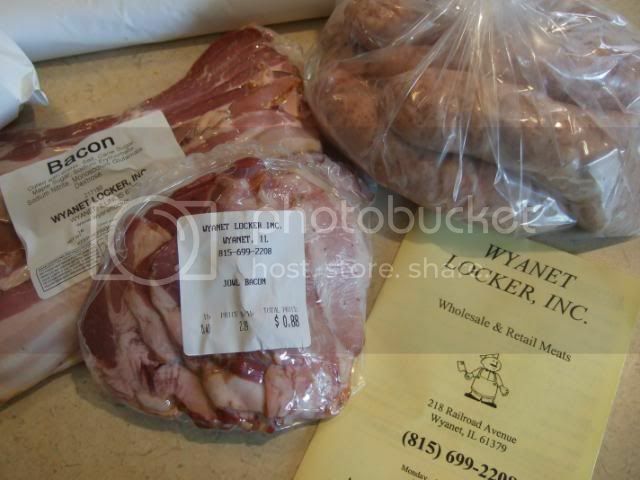 Wyanet Meat locker is solid as well. Not selling as much local farmer animalss as some meat lockers i go to, but the brats I got were top notch as well as a nice chunk of sirloin. Nice spot Ill visit again.